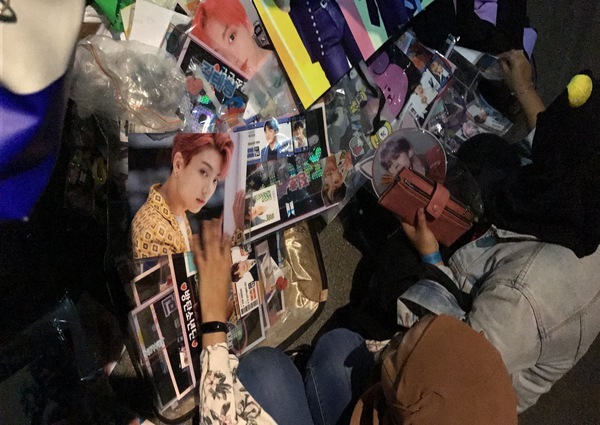 BTS fans are hungry for merchandise, it seems. Twelve hours before the K-pop phenomenon was due to play to a 45,000-strong crowd on Saturday evening (Jan 19), concert venue National Stadium became a literal warzone for ARMYs (the official fandom of BTS) who congregated in hopes of getting their hands on some merchandise. With a long queue forming on Friday night, the official merchandise store was opened two hours ahead of time on Saturday morning. However, cashiers only began checking out purchases at 9am, the original stipulated time. 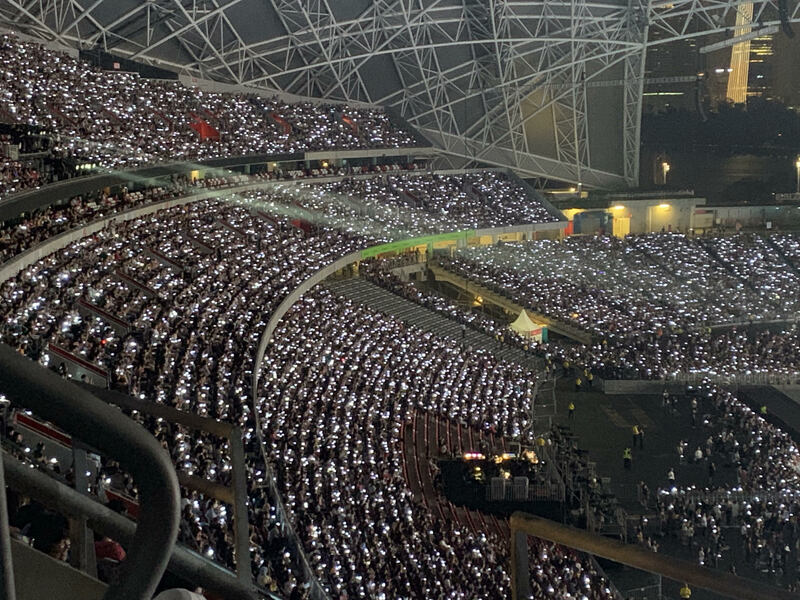 Looking at the sheer number of Bangtan bombs ($55 lights sticks used in concerts) during the show (pictured below), it is safe to say that ARMYs are willing to spend a bomb to support the boys. Other than lightsticks, ARMYs were willing to hustle for pricey unofficial merchandise peddled by dozens of vendors. Check out what we found at the scene. This quirky headgear is definitely one of its kind. The accessory became a trend on social media after BTS was seen wearing it. The packaging of this item may seem baffling at first sight, resembling a compressed furball in plastic wrap. 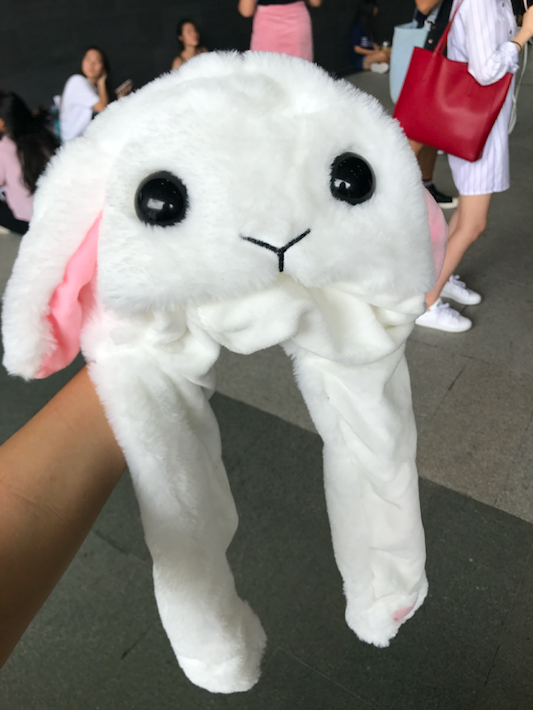 Just peel open the bag and it will unveil an adorable bunny hat with ears that perk up when squeezed at the handles. On the day of the concert, we spotted some happy fans wearing these despite the scorching heat. Inside this kit, fans found meticulously airbrushed posters of their 'bias' (favourite member of a group), along with a plane boarding pass with his name and seat number, as well as a 'face fan' and a picture card. With the boys looking dashing or sporting funny expressions, the 'face fans' became a must-buy for many BTS fans. A big hit among the crowd, fans were seen readily digging in the treasure pile for their 'bias'. 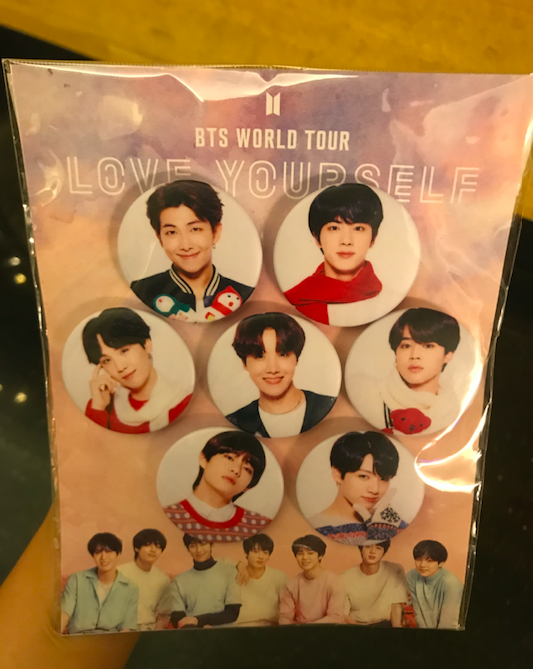 These pins may seem like a random purchase if you're a not K-pop fan but superfans are all about buying miscellaneous items and using them everywhere, everyday. To show support for their favourite band, fans can pin these on their school bags (or work bags, we're not ones to judge). We've got to say that the pins are very pleasing to the eye. Here's a rip-off of an official merchandise. 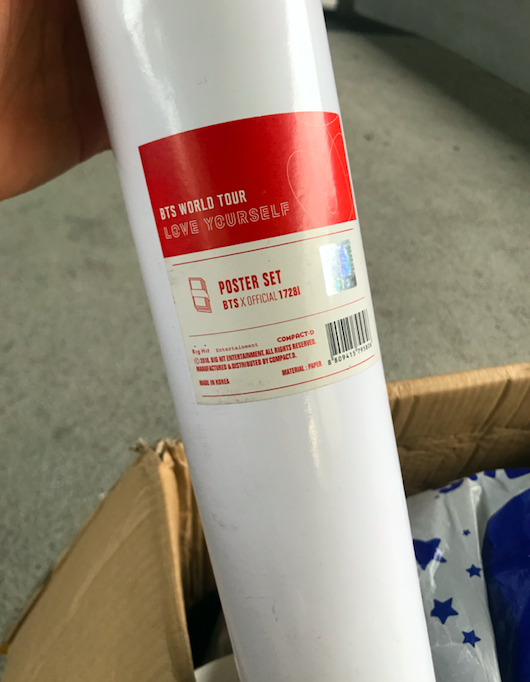 Officially retailing at $33, this poster set was sold at an exorbitant price of $150 by vendors spotted at various locations around the National Stadium and inside the nearby malls. The poster set was not the only item appropriated by these opportunistic entrepreneurs. With the snaking line to the official store commanding a wait of at least two hours, desperate fans naturally sought alternative sources of pleasure. Prices fluctuated according to demand and supply, which made buyers susceptible to rip-offs. Our advice? Get your grabs online or come early to join the official store's queue.